South African Police Group of 5(All Named) to 031876W Adjudant Officer Jacobus Adriaan Baardt. 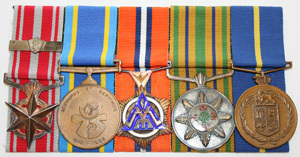 Consisting of SAP Medal for Faithful Service(dated 13.5.75), SAP Star for Faithful Service(dated 1979.05.01), SAP Star for Merit(dated 1985.05.13), SAP 75th Anniversary Medal and SAP Medal for Combating Terrorism with a Bar. Plus 2 pages indicating that he had 35 years and 293 days service.